Creating an engaging and enticing custom thumbnail is one of the most important parts of creating YouTube content. While YouTube will automatically create one for you, it’s usually not very good, which reflect poorly on your content. Nobody has time to click through to a video from a terrible thumbnail. Your Click Through Rate will increase dramatically if you offer the viewer a peek at the content first. Luckily, our vidIQ thumbnail generator allows you to make custom thumbnails right in the browser. The vidIQ custom thumbnail editor allows you to add text, shapes, custom images and even make a thumbnail template to make every custom thumbnail a little more eye-catching. Just go to your YouTube Video Manager page, where you’ll find a vidIQ button. 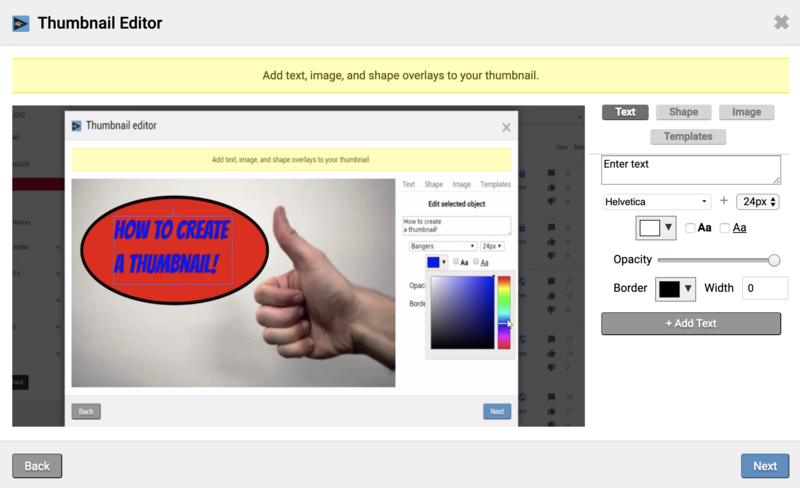 Click on ‘Thumbnail Editor’, then choosing a frame from your video, or uploading one. Then you can add a color, font and border for your text plus a range of other features. The editor even will even show you how each thumbnail looks across YouTube, Facebook & Twitter!